Western Digital has announced a new family of hard drives specifically for data centers. 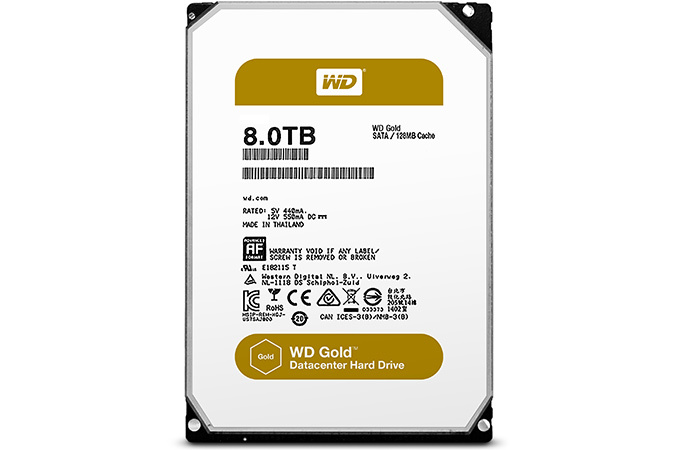 The new WD Gold HDDs will feature multiple technologies that the company uses to build other drives, including helium and large caches. The WD Gold HDDs will co-exist with the company’s WD Re drives for some time, but as the new family expands, it will eventually replace the previous-gen devices. The initial WD Gold family will consist of three models: with 4 TB, 6 TB and 8 TB capacities. All three drives seem to be based on different platforms and on different platters, but all of them have 7200 RPM spindle speed and feature new-generation electronics, which is claimed to improve power efficiency by up to 15% according to WD. The new drives come in a 3.5” form-factor and will use SATA 6 Gbps interface exclusively at this point. The WD Gold HDDs are designed for a variety of applications, including small to medium-scale enterprise servers and storage, as well as rack-mount data center servers and storage enclosures. Being data center-oriented HDDs, the WD Gold hard drives are optimized for RAID environments and they support enhanced RAFF technology that protects against vibration (by monitoring linear and rotational vibration in real time) as well as head positioning system with two actuators, which improves positional accuracy. The drives also support WD’s time-limited error recovery technology (TLER), which prevents drive fallout caused by extended HDD error recovery processes. The flagship WD Gold hard drive with 8 TB capacity is Helium based, similar to the HelioSeal platform originally designed by HGST. Western Digital does not reveal the number of platters inside the drive but confirms that these are PMR (perpendicular magnetic recording) platters. Using helium rather than air between the platters helps to reduce power consumption of HDDs compared to non-helium models due to the lower drag force coefficients of helium compared to air - this allows for less friction between heads and the air, as well as platter spinning. All WD Gold HDDs are rated for 2.5 million hours MTBF to signal high reliability. Next up is the WD Gold 6 TB HDD, which uses a more regular HDD arrangement in air, but which features a media-based cache to improve random write performance over the previous generation WD Re 6 TB hard drive. WD is claiming up to 30% better random write performance. Western Digital does not reveal a lot of details about its “media-based cache”, but it is logical to assume that it uses NAND flash memory as a write buffer which then spins down onto the platters during downtime. Unfortunately, we have no idea about its capacity or actual performance. The drive features modern PMR platters and it may be the world’s first data center-class hybrid HDD (with rotating media as well as NAND cache) for nearline applications. 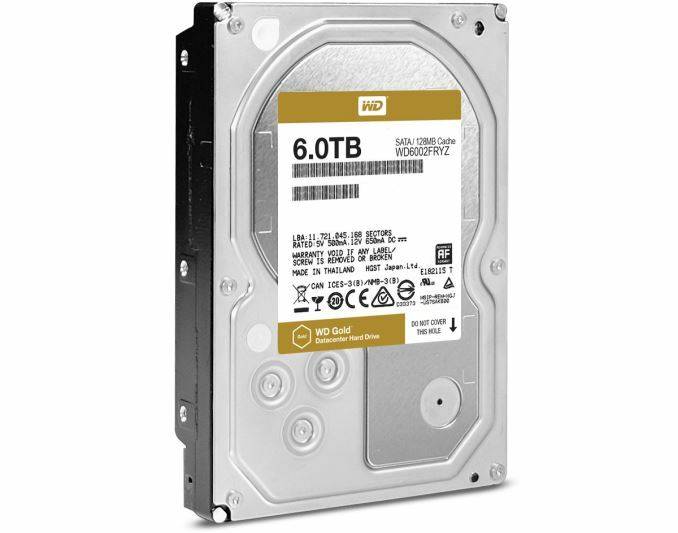 It is interesting to note that also the drives are sold under the WD trademark, they have HGST's markings, which may mean that they were developed by Western Digital's Japan-based subsidiary. The entry-level WD Gold 4 TB model is claimed to offer up to 18% sequential performance improvement over previous-generation WD Re 4 TB data center drives, but the company does not reveal whether the new HDDs also feature any media-based cache, or its performance advantages are a result of the new electronics, new platters, and/or a new controller. Just like the 6 TB model, the WD Gold 4 TB has HGST Japan marking. The new family of WD Gold hard drives demonstrates how Western Digital can build HDDs that are tailored for particular needs, which is becoming more important in an industry that is seeing unit volumes decrease over time. The flagship WD Gold 8 TB is optimized for lower power consumption and higher capacity, whereas the mid-range WD Gold 6 TB is optimized for performance. 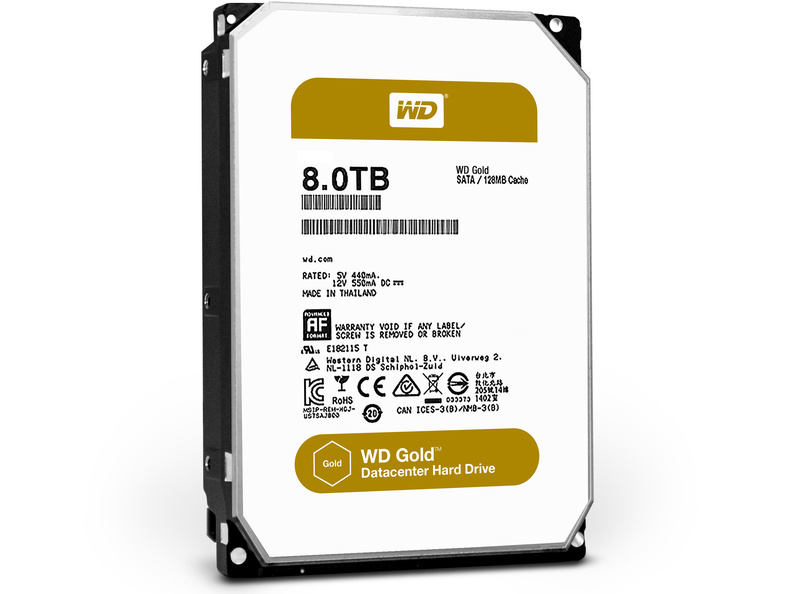 The new WD Gold HDDs are available at select distributors and resellers in the U.S. as well as from the company’s online store. HDDs currently employ no form of parallelism whatsoever. Notice how low capacity SSD are usually slower - that's because their low nand chip count and lower level of parallelism. Add more chips, run them in parallel and you get higher badnwidth. This is not the case of HDDs, they don't get faster with the number of platters increasing, regardless of the number of platters and heads, only one single head will read from one platter surface at a time. Modern HDDs are approaching 200 MB/sec, and have up to 8 platters, that's 16 platter surfaces, and 16 heads. Add in some platter level parallelism, and you get 200 x 16 = 3.2 GB/sec, which is where the fastest PCIE SSD's are. Yesterday, I finished updating my DEC 2013 rig. Upgrades consisted of migrating the components to a new case (Corsair 780T), mounting three additional fans on the case for a total of six, as well as replacing my two WD Green 2TB drives for two brand-new WD Blue 6 TB in Raid 1. I could find no drives for sale with higher than 6 TB capacity. I couldn't even find WD Green 6 TB drives either so I just went with WD Blue 6TB's. anyone else remember when a 5 year warranty on a Hard drive was common?